Care Luxury Hotels & Resorts Go Straw-less with #JustSip Campaign | Care Luxury Hotels & Resorts is proud to announce that all hotels and resorts under the hospitality management are now serving drinks straw-less in conjunction with their corporate social responsibility initiative, #JustSip. #JustSip campaign is a part of Project Local Love (previously known as Care Luxury CARES) which is the management’s corporate social responsibility effort that every co-partner in the organization work with – each and every day – to ensure that we’re doing our part to build a sustainable tomorrow. 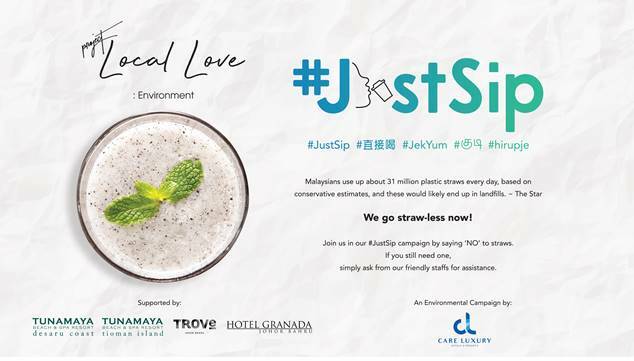 All four hotels & resorts including Hotel Granada Johor Bahru, Tunamaya Beach & Spa Resort Desaru Coast, Tunamaya Beach & Spa Resort Tioman Island, and TROVE Hotel Johor Bahru will serve drinks straw-less starting 1st February 2019 in support of government’s decision in banning plastic straw usage by January 2020. Guests of the hotels and resorts who in need of special care that require straws will be accommodated with paper straws which available upon request. “We are excited to jump on the bandwagon and we believe that small changes can make a big difference in a long run for our environment and the future besides to eliminate number of single plastic straw usage which earlier contributes to marine plastic pollution,” said Care Luxury Hotels & Resorts Chief Operating Officer, Jeslin Chong. Jeslin continued that the management has always been motivated to opt for various options for the planet’s conservation initiative and to name a few, Care Luxury Hotels & Resorts practices in providing biodegradable in-room amenities, coral restoration in Tunamaya Tioman Island, and recycled plastic art installation exhibition in TROVE Hotel Johor Bahru. To ensure the mission is brought to life, Care Luxury Hotels & Resorts initiated a partnership with an independent local apparel brand, Stickybox for the campaign which will be led to a series of programmes such as to outreach schools for environmental awareness educational talks and sustainable environment events within this year. P/S: Bagus jugak macam ni, sis kauu pun kadang-kadang tak ambil straw sebab malu baca nota kat straw box mana-mana kedai makan. Kadang-kadang ambil jugak bila lupa pasal isu straw ni. 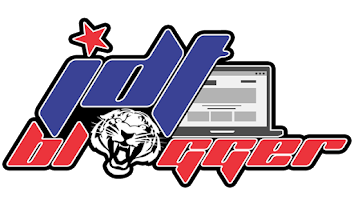 Kena betul-betul konsisten lepas ni.